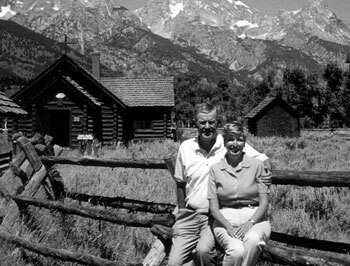 Pat and Kathi Rile in front of the Chapel of the Transfiguration in Grand Teton National Park, where they were married years before. A champion of entrepreneurship, alumnus Pat Rile went from striving cookware salesman to successful investment adviser. Entrepreneurship is not just about starting a business, Rile says. It’s about leadership and creativity and being proactive. And, like so many things in life, it’s about relationships. That’s why he and his wife, Kathi, an alumna of the College of Arts and Sciences, established the Rile Chair of Entrepreneurship and Leadership—to teach entrepreneurship in the College of Business through an endowed faculty position that supports program development, education, research and service. Dedicated UW benefactors, the Riles have also supported facilities, excellence funds, scholarships, athletics and the colleges of Business, Arts and Sciences, and Health Sciences. Rile is a College of Business Distinguished Alumnus, is on the UW Foundation Board of Directors and has served as board chair. The university is full steam ahead with its robust entrepreneurship programs, which include a major and a minor, a yearly entrepreneurship summit, the John P. Ellbogen $50K Entrepreneurship Competition, the new Institute of Innovation and Entrepreneurship, and the Fisher Innovation Launchpad through the Wyoming Technology Business Center, among other things. The state, too, is boosting initiatives that diversify our economy with the ENDOW (Economically Needed Diversity Options for Wyoming) program. Rile explains that an investment of $1,000 at age 22 will grow to be approximately $64,000 at age 62 at the standard rate of investment growth of 9.2 percent with dividends. That’s without adding another penny. “Time and compound interest is the pot of gold,” he says. Now that Rile is retired—or, as he says, on permanent sabbatical—he’s thinking a lot more about what’s important.